Large deciduous shrub with silvery foliage. Autumn olive grows up to 20’ tall. Twigs are covered by small silvery scales. Leaves: Simple and alternate. Autumn olive’s leaves are dark green on top and silver-gray on the underside, lance-shaped or elliptic, with entire, wavy margins. It has a gray-green hue when seen from a distance. 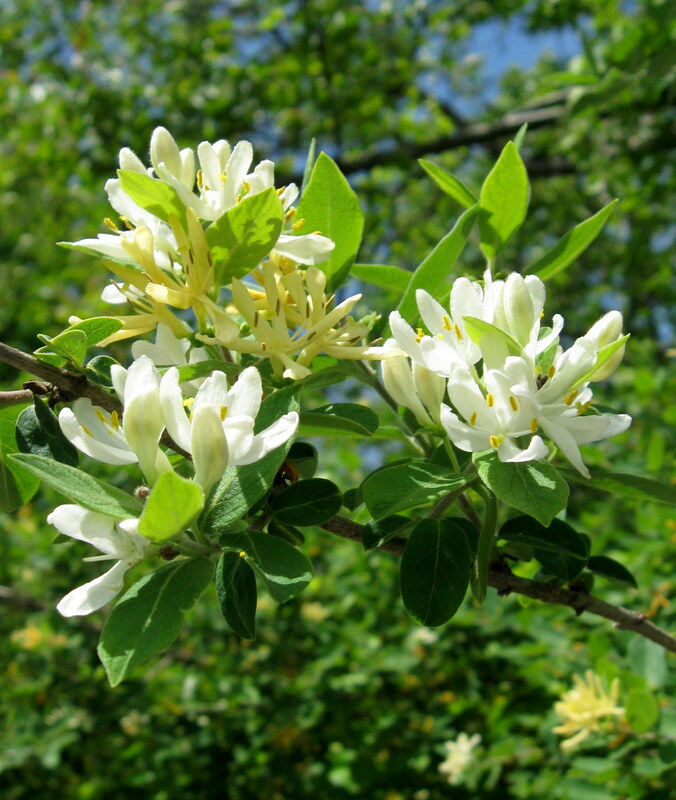 Flowers: Tube- or bell-shaped, fragrant, and borne in leaf axils. Bloom in late spring. Autumn olive flowers are creamy white to light yellow. Fruits and seeds: Fruits of the autumn olive are small, fleshy, egg-shaped, and pink to red with silver scales. Seeds are dispersed by birds. Roots: Associated with nitrogen-fixing bacteria. Cutting or other damage causes root suckering. Similar species: Russian olive; invasive (Elaeagnus angustifolia) is a tree that can reach 30’ with twigs that have a terminal spine. Russian olive’s leaves are silver on both sides, longer and more lance-shaped and the flowers are yellow inside and silver outside. Fruits of Russian olive are yellow, dry, and olive-like. This aggressive invader prefers open areas, including wet areas; it uses water more quickly than native species, and it can dry out riparian areas. Two native buffaloberries, silver (Sheperdia argentea) and russet (S. canadensis), have silvery foliage but their leaves are opposite. • Autumn olive invades open and forested natural areas, as well as roadsides and agricultural fields. • Thrives in high light conditions where it can produce numerous fruits. • Alters nutrient cycling by adding nitrogen to the soil. Photo released under creative commons license.